While previous studies have identified short-term weight gain following the start of antidepressant treatment, this study reveals that the risk of weight gain is elevated and sustained for multiple years after the start of treatment. The King's team analysed the electronic health records of just under 300,000 UK patients—136,762 men and 157,957 women, from 2004 to 2014. 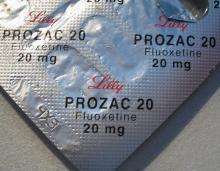 The group was analysed according to whether or not they had been prescribed an antidepressant in a given year and was made up of patients from all weight categories—from normal with a BMI ranging from 18.5 to 14.9, to super obese—with a BMI of 45.0 or greater*. More information: * The King's team analysed the electronic health records of just under 300,000 UK patients -The group was made up of patients who were classified as being of normal weight (BMI between 18.5 to 24.9), overweight (25.0 -29.9), simple obesity (35.0-34.9), severe obesity (35 -35.9), morbid obesity (40.0 to 44.9) and super obesity (45.0 or greater).